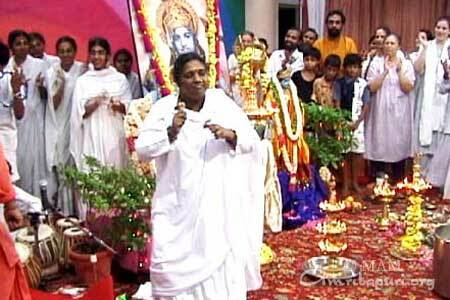 Swami Ramakrishnananda Puri, one of Amma’s senior-most disciples, visited three countries in South America in late September 2001. Programmes were held in Argentina, Brazil and Colombia. All programmes were well attended by large numbers of people eager to hear about Amma and fervently praying the Divine Mother Herself will one day visit in person. Swamiji’s programme in Buenos Aires, Argentina included a special appearance by the Indian Ambassador, Mr. Nigam Prakash, who opened the programme with a warm welcome address. 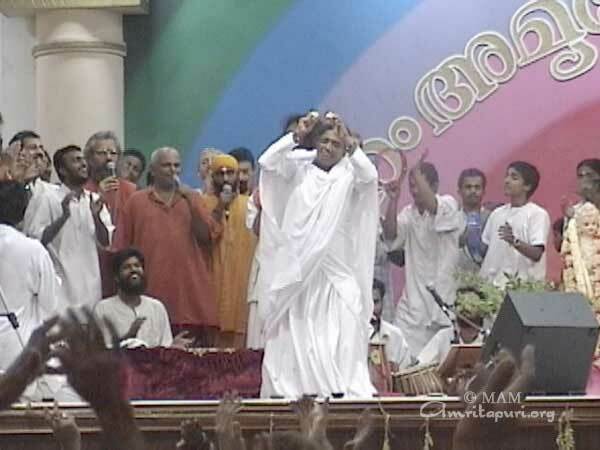 The crowds were highly enthusiastic about Swamiji’s satsangs and bhajans. Swamiji visited Sao Paulo, Brazil for the first time. Large crowds watched a video of Amma’s life story, “River of Love,” in Spanish, followed by Swamiji’s satsang and bhajans. Next Swamiji went to Araruama, outside the city of Rio de Janeiro, to inaugurate the Amriteswari Prayer Hall with a special puja. Earlier Amma had blessed a sculpture of Shiva and Ganesha and Swamiji placed the sacred image in the Hall and performed a traditional worship. 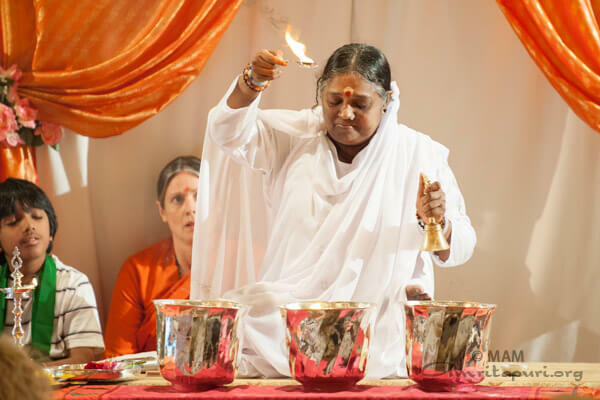 The Hall was overflowing as the Brazilian devotees gratefully accepted the blessing of Swamiji’s presence in the beautiful new facility dedicated to Amma. questions. All present were deeply inspired by the programme held in Amma’s name. In this day and age, when huge lorries can rumble from one end of the ashram to the other, you have to wonder why Mother still calls for sand seva. 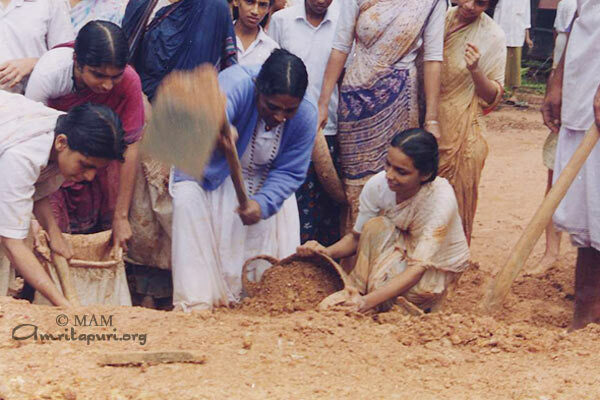 There is a long tradition of sand seva at Amritapuri. It began in the earliest days, when the ashram consisted of a few huts on a higher bit of land with water almost all around. When more huts were needed, or a meditation room, or a temple, land was needed as well. Land was obtained by hauling sand from the seashore or the banks of the kayal (backwaters) and pouring it where the land was needed. If enough people hoisted enough old cement bags full of sand onto their shoulders, or filled chutties (metal “bowls” with two handles) and shared the load with a friend, and took this sand to the desired location and dumped it there, land grew. So in the early days, and really right up into the mid-nineties, it was a not uncommon event that the ashram bell would ring sometime after the evening meal, and everyone able would hurry to whatever site Mother had decided upon, and join Mother in the labour. Remember working your way up through a long line of people so that you could hold your sandbag for Mother to fill for you? Did you ever trudge along with a full bag on your shoulder, chanting your mantra, and suddenly look up to see Mother right beside you, carrying Her load? Remember how She would stand at the destination site, showing each person who arrived exactly where She wanted his or her bag dumped. All of this used to make sense, in the days before there was even so much as a real road, never mind a truck, at this end of the island. There were no alternatives: you want land, you carry sand. You want space, you clear rubble. But now, in 2001, there are high-rises in this ashram. No one lives in huts anymore. Passages have been widened to roads and daily large trucks pass easily from one end of the ashram to the other, bearing big loads of cement and construction lumber, or mounds of vegetables, or dozens of cooking gas canisters. Who would dream of carrying individual bags of sand from one end of the ashram to the other? Who would even consider squatting in a huge mound of construction rubble (results of excavation for the big new high-rise coming up east of the temple) and, rock by stone by broken brick, filling old bags with the debris so that they can be hauled by hand or on a two-wheeled cart over to the boat jetty? And if Mother does, so does everyone in the ashram: westerners, brahmacharinis and brahmacharis, householders, swamis, computer students and visitors. And not just the young and vigorous: everyone. There is no compulsion, mind you. Just, a bell rings, word goes around that “Mother is out for sand seva!” and suddenly so is everyone else. You don’t have to go. As Mother says so often, “Mother doesn’t push.” But what you miss if you opt out! It’s crazy, when you think about it. Who wants to go out after a nice comforting supper, when really it’s time for bed, and get completely filthy, develop aches in back and legs and shoulders, probably raise a few blisters on soft hands or suffer cuts on tender feet? And this is the rainy season, so the sand and rubble you carry will be wet, and more than likely you will be, too, when the skies open up with anything from a mild drizzle to a major downpour. Last Wednesday, Thursday and Friday nights, the bell rang, and the grandmothers and grandfathers came. The little kids came. And everyone in between. One old man arrived, pulling his airline hand-luggage cart so that he could strap his sandbag onto it. A woman in a wheelchair would not be stopped: she carried her load on her lap. Another with a walker was there, a suitably-sized sandbag clutched to the aluminium frame as she picked her way carefully from outside the hospital gate all the way past the temple, through the main gate, into the “press side” area, past the flats and Mother’s parents’ old (and now abandoned) house, right to the dock where the boat race will start next week. Partners would share a bag or a chutty, matching their footsteps so that they could progress smoothly. Some children raced back and forth at the typical high speed of new life, making up in numbers of trips for the minimal size of the loads they could lift. A grandmother carried the small pail she usually uses for bathwater. A westerner centred his sandbag between his shoulder blades like a familiar backpack. And all kinds of people got help hoisting their loads to the tops of their heads and strode steadily, weight centred, till they could, with a quick nod, drop the whole thing on the destination pile. All this effort, to move dirt from one spot to another? You could tell by the smiles on faces that this wasn’t really all about work, nor all about the goal of moving earth and sand and stones. It was all about sharing the night with Mother. There’s this huge pile of rubble, and Mother is hacking away at it with a manvetti (a sort of cross between a pick and a hoe). She loosens big lumps of dirt and stone, which tumble down as someone nearby scrambles to gather them up into whatever carrying apparatus is nearby. Or She squats down halfway up the side of the mound and with Her bare Hands tugs broken pieces of concrete out of the dirt, handing them off to whichever hands are lucky enough to be there, reaching. Then maybe She mounts to the summit of the rubble heap and gazes out over the two hundred or more sevaks (workers), shouting encouragement to this one, and a scolding to that one. “Sacks!” She’ll call out, and a pile of empty bags will grow at Her Feet. She’ll take one and hurl it…and if you’re lucky you’ll catch it. Prasad! Fill it; haul it, dump it and come back for more. She’ll go on throwing sacks till the pile at Her feet is distributed, and then She’ll sit. With some fortunate person holding a bag open for Her, She’ll scoop up whatever is within arms’ reach, fill the bag, hand it off, and call for another. She spots a lazy non-worker and throws a clod of earth at him, laughing when he’s shocked into the realization that he’s been caught! She’ll see some women leaning on their shovels, worn out, and tease and taunt them into new energy. Her glance will stun a shy visitor who will leave off gaping to look around, wondering, “Is it me She’s looking at? !” Swamini Atmaprana will try fanning Her, and She’ll push her away – how could Mother accept comfort while Her children strain and sweat? A visiting devotee will climb cautiously over the slippery shards to kneel near Mother, seeking Her advice and Her blessing. Mother’s dirt-covered hands won’t refrain from reaching out to comfort or to caress; the baby in the visitor’s arms will be offered a smudged cheek to kiss. This is what it is like when all the facets of the community gather to share a task – a night with Mother. Then there are the surprises: the small events that make it hard to take your load and walk away from Mother – what if you miss something special? But in a spirit of obedience and service, you do your job, and maybe by chance or karma or grace you just happen to be near when a surprise occurs. Like the gloves, or the papaya tree, or the baby frog. 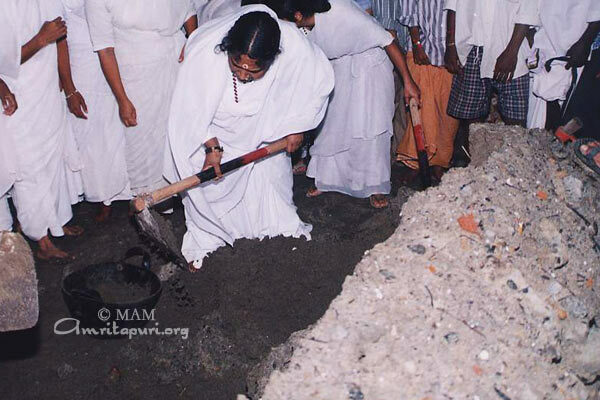 The second night of the sand seva, it was decided that Mother should wear gloves. At first She refused, but upon being pressured, She acquiesced. She took one glove, stuffed Her hand into it, gazed with apparent confusion at the result, shrugged, and donned the other. But how to function, with the glove-thumbs aiming upwards while the flesh-thumbs aim downwards? Helpful counselors nearby pointed out that She had managed to get the gloves not only onto the opposite Hands, but also upside down. Who wouldn’t love the privilege of removing one of Mother’s gloves and rolling it open and holding it just right so that She could slip Her hand in, properly, this time. But Her hands are so much smaller than the gloves that the long glove fingers hang empty. That doesn’t stop Mother, who, once properly outfitted, resumes work, scooping dirt and stones together between Her palms and depositing them in the bag held open beside Her, calling out orders while She works. She has run the gamut from being a helpless two-year-old (and you felt just like a mommy) to being the Boss (and you shrink back out of the way lest your lingering to watch attract Her attention). And in watching all this, and marvelling, your heart was opening up. Then there was the papaya tree. On the third night of sand seva, Mother was causing Her children no end of concern by Her refusal to wear either shoes or gloves. She was scrambling up the nearly vertical slope of a pile of rock and concrete chips when She stopped short. “Who cut that tree?” She demanded, gesturing towards a truncated young papaya tree with only about four branches, bright and healthy leaves! – and a stem (precursor to a trunk) stretching up to where it had been rudely cut. No one confessed; that wasn’t the point. Ascertaining that the tree was alive, Mother immediately stopped the mound demolition work closest to the tree and told one of the brahmacharis to dig it out carefully. Its top was gone, but its roots were unhurt; it could live. “Take it away and plant it,” She directed. The ashram had to expand; for that, coconut groves had to be sacrificed; Mother needed to accommodate the thousands who come home to Her. But necessity is one thing, and carelessness with life another. Mother recognises the former and will not countenance the latter. Everything pulsates with life, and has feelings. She has told us this time and time again. But when in the midst of such driving work She stopped to save a small papaya tree, She turned from talk to action and drove home Her message in a way that philosophising never could. The young tree safely removed, Mother continued Her demolition of the rubble heap, inching steadily higher while the hill itself grew smaller. With the help of eagerly outstretched hands, She clambered to the top, and sat. Sat to work. Immediately She was scrabbling together more dirt and sand and rocks, and beginning to fill a chutty. There was a small movement of something clinging to Her dress – a baby frog. Just out of tadpole stage, this tiny fellow clung successfully even though Mother’s dress was moving. She reached Her Hand down and cupped it over him gently but decisively. She who can’t resist loving even a frog held him close and announced: “I’m not leaving you until your Amma comes for you.” But was that an excuse to stop working? Not in the least. Deftly Mother tied the little fellow into a cosy “room” made by the end of Her sari. Where other ladies tie their coins (saris don’t come with pockets), Amma tied Her baby frog, and started to work again. Every now and then, She would stop grabbing for rocks and instead take up the end of Her sari, feeling softly for the baby – Ah! He’s there! Or sometimes a look of consternation: “Poyi! He’s gone!” And suddenly relief, “Here he is!” Still safely tied in his soft chamber, he hadn’t really fallen out at all. Mother would check the security of the knot, and start working again. Just left of Her as She sat there cross-legged, there was a sudden movement: “It’s a bigger frog!” someone nearby called out. “Then you can go,” She said, and released the baby. Love but let go. It sounds like another of Her teachings. Be compassionate towards all beings; that sounds familiar as well. Words into action, once again. 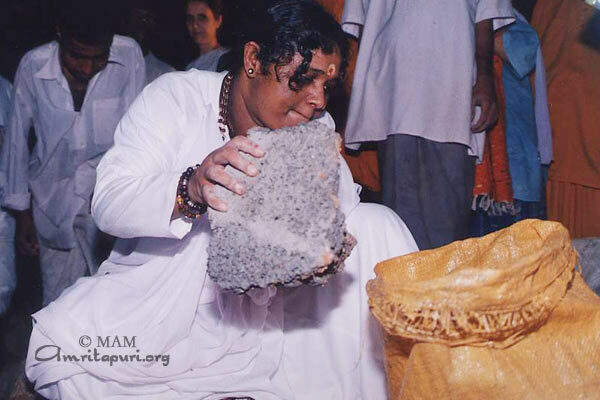 Amma cannot do much for long without ending up teaching us. It is Her Nature. She calls us to carry sand, and joins in Herself, and we actually witness – and cannot but admire – selfless service. She does Her work with fullest attention, and we witness shraddha. She never loses awareness of the needs of those around Her – people, plants or frogs – and we recognize caring and compassion. She is cute and playful and we see that a spiritual person need not be drab nor dreary. 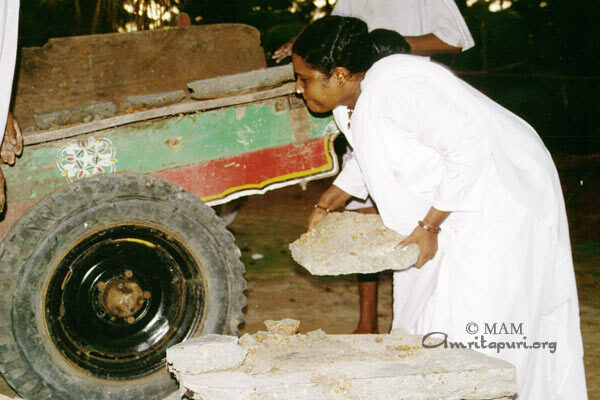 Amma calls everyone for sand seva, and tells us (as She did at Satsang on Friday) how happy She was to see even the grandmothers and grandfathers working, carrying what they could. It is the attitude of readiness to make whatever contribution we can that counts, She told us, not the quantity we contribute. There is a tradition of spiritual aspirants voluntarily taking on tapas (austerities) in order to be changed. They might wear hair shirts or stand on one leg for ten years. Some undertake extensive fasting, and some take vows of long silence. They choose tapas intentionally. You won’t see a lot of that kind of tapas in Amritapuri. Our compassionate Guru provides opportunity for tapas but disguises it as play. She lets us balance on sliding shards, shoulder heavy loads, stay out in the dark and wet, be pushed and pulled by other struggling sevaks – NONE of which we would ever choose for ourselves. How we handle the discomfort, the pain, the inconvenience – that’s where our spiritual work, and growth, comes in. When work time is ended, Mother sits among Her sweat-stained children for yet another half-hour or so, handing them treasured prasad: a few banana chips. Those who can tear themselves away from the close circle around Her can take steamy cups of sweet coffee, and look up at the almost-full moon not quite hidden by the waving tops of the palm trees behind Mother. Naturally everyone is worn out. But no one is ready to leave the presence of the Divine Child, the Labourer, the Director, the Mother of a tree and a frog, our Guru. Maybe it takes a cloudburst (as occurred on the second seva night) to put an end to the festivities and send Amma to Her room and everyone else off to showers and to bed. Question: What is the first thing that is needed to advance on the spiritual path? Mother: When a flower is still a bud, we cannot experience its beauty or fragrance. The flower first has to blossom. It is useless to try to open it by force. We have to wait patiently for the bud to unfold on its own. Then we will experience its beauty and fragrance in all its glory. So it is patience that we need before anything else. In every stone there is a potential icon lying concealed. It is when the sculptor chisels away all the unwanted parts that the divine form emerges. The stone has to offer itself to the sculptor and patiently lie before him for a long time. It is as a result of this that the beautiful form finally appears. A stone lying on the lower plane of Sabarimala (a holy mountain, on top of which there is a famous temple) was complaining to the icon of the Lord being worshipped in the temple: “You are a stone just like me and yet you are being worshipped by everybody, while I am being trampled. What injustice is this?” The icon replied, “Now you see only the people worshipping me. But before I came here, a sculptor chiselled away at me hundreds of thousands of times. During all that time, I patiently lay before him, without the slightest resistance. It is as a result of this that I am here now and am being worshipped by millions.” It was the patience of that stone that had transformed it into an image of worship. Everyone knows the story of Kunti and Gandhari. It is a story that teaches us the benefit that comes from patience and the harm that ensues from impatience. When Kunti gave birth to a child, Gandhari, who was pregnant at the time, was upset. She had badly longed for a child and had wanted her child to be born first, hoping that he, then, would become king. In her extreme impatience she beat her own stomach so hard that it caused her to miscarry, and she aborted a piece of flesh. Following the instruction of the sage Vyas, the piece of flesh was cut into a hundred pieces and placed in hundred urns. In due course, a hundred sons were born out of the urns. This was the origin of the Kauravas, who were the cause of the destruction of millions of people. Ganhdhari didn’t have any patience, and the result of this was the cause of so much suffering and destruction. On the other hand, what is born out of patience becomes victorious. In spiritual life, patience is a vitally important quality. We should learn to always have the attitude of being a beginner, like that of an innocent child. Only a beginner has the patience to really learn. And he alone will have the necessary shraddha. There is a child within all of us. At present it is slumbering. We have to awaken that child. The present sense of “I” is the creation of the ego. When the sleeping child within us is awakened, innocence will be our nature. We will have the desire to learn from everything. Then patience and shraddha will follow naturally. Thus, as the child within us unfolds, his qualities will fill our whole being. Then the old “I” of the ego will no longer have a place to reside. If we always have the attitude of a beginner, every situation will be an opportunity for us to learn. If we can maintain this attitude throughout our lives, until the very end, we will not lose anything — we will gain everything. Today, everyone only knows only the smile displayed by the teeth. But a true smile is the smile of the heart. Only with an innocent heart can we experience real joy. For this we have to awaken the heart of the innocent child within us. When we say, “If you are zero, you can become a hero,” we are referring to the illumination of the egoless child within us. 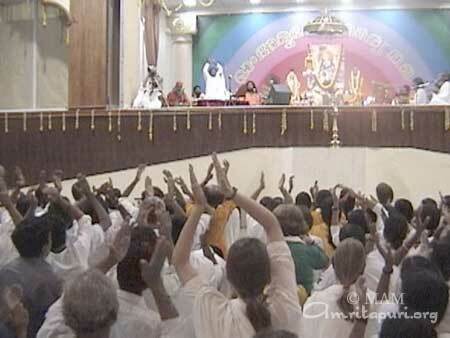 Tuesday is a day set aside for meditation at Amritapuri. 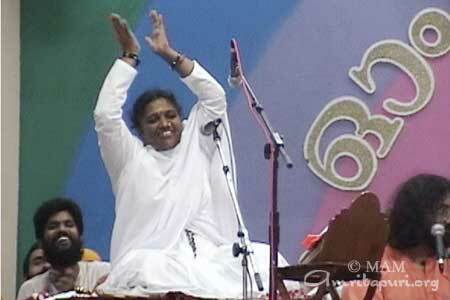 It also provides a precious opportunity for all the residents to spend a few hours in Amma’s presence. At this time Amma can give all Her attention to answering questions and discussing spiritual matters with Her children. In the morning everyone gathers in the temple to sit in silence and contemplation; late in the morning or early in the afternoon Amma arrives, and, after a guided meditation, gives satsang and prasad. Today, before the guided meditation, Amma asked everyone to dedicate the benefits of their meditation to helping the souls of the departed and to easing the suffering of all those who have lost a loved one, as well as for the peace of the whole world. Amma also said that She was very happy about the special archanas and prayers for peace which continue to be conducted every day at Amritapuri. Originally scheduled for seven days, in the light of the events taking place in the world, these prayers will continue indefinitely. About these prayers, Amma said that they really do have an effect. She reminded everyone that some years ago, when the Skylab was going to fall to earth, even the scientists asked everyone to pray that it land in the ocean, so that no one would be hurt. 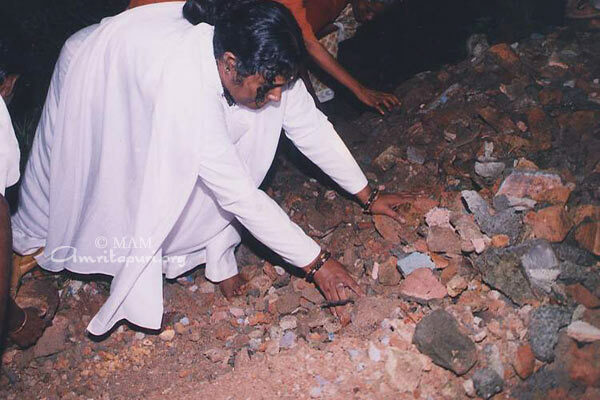 Amma said that at that time, even the atheists began to focus their attention on that goal. And, when it did fall to earth, where did the Skylab land? Not in a populated area, not on land at all, but at sea. Amma said that in the same way, surely prayers for peace will reduce people’s suffering and reduce the magnitude of conflicts in the world. When some people act indiscriminately, countless innocent people suffer. 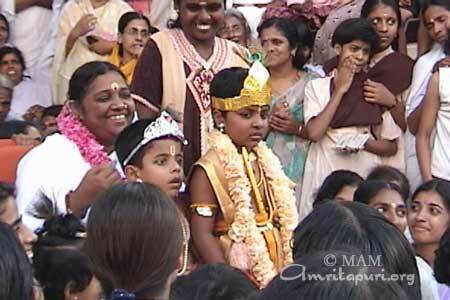 Amma is extremely pained to hear that many of Her American children are suffering. Amma is praying for them. After Amma heard the news (8:00 p.m. Indian time/10:30 a.m. New York time), Amma waited anxiously without food or sleep until daybreak to hear the latest updates on the situation. If only people would ponder deeply about the plight of those who were trapped in those burning buildings – the distress they suffered, their desperate cries for help, and the intense panic that even caused some of them to jump out of the windows – no one would ever commit such an atrocity again. My children, let us all pray for the peace of the departed souls and the quick recovery of those who were injured, and for the welfare of all beings in the world. After evening bhajans on Tuesday, Amma was informed of the terrible tragedy in America (9/11 at the World tade center, New York), which had occurred less than two hours before (due to the time difference of nine and a half hours, it was then around 8:00 pm at Amritapuri). She spoke with Br. Dayamrita Chaitanya at the San Ramon ashram, and Swami Ramakrishananda Puri, who had just arrived in New York City on Monday to conduct satsang programs. He was not near the downtown area and is safe. He cancelled his New York satsang on Tuesday, and spent his day in prayer with local devotees. Beginning the following day, in addition to the morning archana, which takes place every day at Amritapuri, special archanas have been conducted, specifically for the souls of the departed and to ease the suffering of the injured and the bereaved. There are now four of these special archanas taking place each day, at 7:15 am, 10 am, 4:30 pm, and 9 pm. Also, a continuous chant of LOKAH SAMASTAH SUKINO BHAVANTU takes place every morning from 8:30 to 9 am. These special prayers will continue for seven days. On Wednesday evening, a special puja was conducted in the kalari. At this touching ceremony, Americans present were given an opportunity to offer flowers at the altar for the souls of the departed. Since Tuesday even the regular spiritual practices being conducted at the ashram seem to have taken on a deeper significance for many, some of whom previously may not have had such a personal relationship to the suffering and strife taking place in the world. Especially the following prayers, can be heard being chanted with renewed sincerity and devotion. May all beings in all worlds be happy and peaceful. After bhajans all the devotees took their dinner and, as Amma returned to the auditorium, settled down to watch a evening of performances including a dramatic, musical staging of the Bhagavad Gita, produced and performed by ashramites. Directly after the performances concluded, the reciting of the Srimad Bhagavatam, the Purana which describes the life of Sri Krishna, was begun. The Srimad Bhagavatam narrates that Sri Krishna was born at midnight. Therefore, the reciting is scheduled so that the portion of the Purana describing Sri Krishna’s birth is chanted at midnight exactly. Just before midnight, oil lamps and camphor were lit all along the front of the stage. When the actual moment occurred, the entire ashram burst forth in celebration. The musicians from the parade earlier in the day returned to play the marching beat of victory, as the devotees erupted in cheers. Conchs were blown, and every bell in the ashram rang out simultaneously. 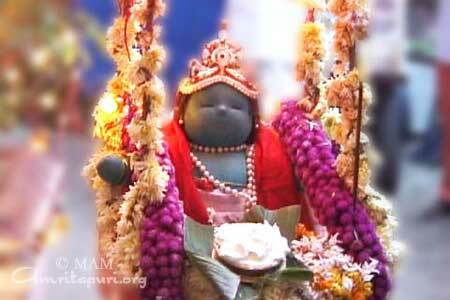 Then the arati was performed to the idol of the Baby Krishna. At the same time, Swami Amritagitananda Puri placed a beautiful garland around Amma’s neck and performed arati to Her, the living embodiment of Krishna. After the arati, Amma led the joyous crowd in special bhajans that are sung only on Krishna’s birthday, beginning with Agatanayi Agatanayi Vishnu Devan! (Lord Vishnu Has Come!). 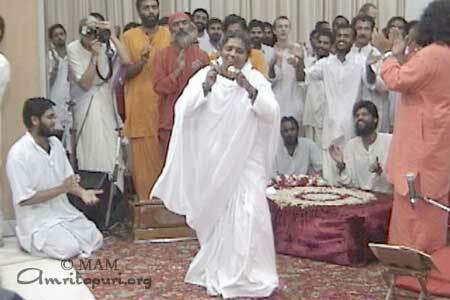 During the last bhajan, Govind Gokula Ayo, Amma stood and danced, cymbals in hand. The front of the stage was packed with enthusiastic devotees, dancing, clapping and jumping in time with the devotional music. 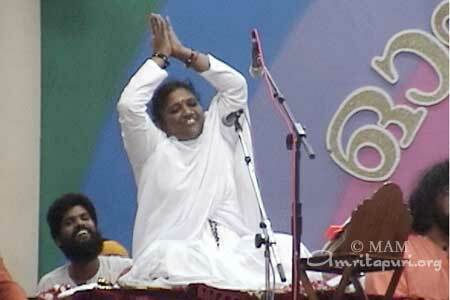 Then, when Amma withdrew Herself in spontaneous meditation, all present remained motionless and silent. It had been a day to celebrate the Divine Incarnation of Krishna. Now here they were, fortunate enough to spend this day with their own beloved Amma, and for a few moments they were allowed to witness Her retreating to the unfathomable depths of Supreme Consciousness that only She knows. After a few minutes, Amma stood again and served payasam to all the visiting devotees. As always on Sri Krishna’s birthday, today was a day of great festivity at Amritapuri. The celebrations began at three o’clock in the afternoon with a parade to the local Krishna temple. The procession was headed up by some of the ashramite children costumed for the day and carrying an ashram banner, followed closely by a band of enthusiastic young trumpeters and percussionists, and Amritapuri ayurvedic doctor cradling a lovely Krishna doll made by hand at Amritapuri. There were also a joyous group of AICT students led by three dressed as Krishna, Radha, and Balarama; and of course many of the ashramites and visitors. The local people gave a warm welcome to the merry procession, setting out pujas with oil lamps and often pictures of Amma. The locals seemed to especially enjoy the children dressed as Radha and Krishna, often calling out at the sight of them. At the Krishna temple a grand puja was set up with pictures of Amma as well as Krishna. The local priest performed traditional worship to Krishna doll, adding a garland of flowers to the ones the doll had received en route. The parade circled the temple and was greeted with another puja and refreshments on the other side. After a short break all proceeded back to Amritapuri, passing many more friendly locals and the best they could provide in the way of brass lamps, ornaments, and pictures on the way home. 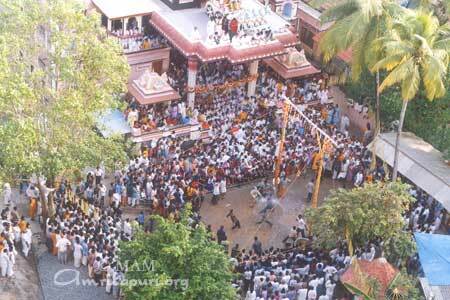 Celebration No sooner had the parade reached the ashram grounds than Amma made Her first appearance of the day (since the end of Devi Bhava at seven in the morning), joining the the throngs gathered in front of the temple to watch “Uriyadi”, the traditional sport of the day. The game is played by children–and, after a while, many adults who couldn’t resist joining in the fun–who attempt to break a clay pot which is hung by a pulley and manipulated from the other end to rise and fall quickly, taunting the players who have only a short wooden stick and the length of their legs with which to reach the pot. To add to the challenge, people stand along the sidelines and dash water at the players as they swing for the pot. There were many near misses followed by gasps and groans from the crowd, and an occasional burst of cheering when someone managed to break open the pot. Even a ninety-year-old grandmother – Pattammal -was inspired to join in the game, behaving just like a small child as she swung innocently at the hanging pot. The game is played in commemoration of the many sports and games Krishna played with the gopas as a boy. Amma watched the games attentively, applauding enthusiastically when a pot was broken and watching with motherly concern when some of the AICT students climbed on one another shoulders, making a three-tiered human pyramid in order to reach the pot. Still, like any mother who wants her children to be happy, She consented to let them attempt the trick repeatedly, even as She clasped Her hands together in prayer while they teetered back and forth in the air, and stood out of Her seat to see that all were unhurt when they leapt away from each other. Upon seeing them safe, sound, and happy, She applauded their efforts and beamed with childlike delight. Finally, after nearly two hours, Amma returned to Her room briefly before coming out for the evening’s bhajans. Ordinarily, we face our experiences in three ways. We try to run away from situations, we try to change the situations believing that our problems will be solved in that way, or we bear the circumstances while cursing our lot. Running away from a situation will not help us to avoid our problems because, if we do, the difficulties are likely to come back to us with double intensity. Amma remembers a story. A young man had an uncle who was in the military. One day he received a message that his uncle was on his way to visit him at his house. This was not good news to him because his uncle was a non-stop talker. The old man was in the habit of relating endless stories about his adventures in the military, and he had a lot of stories to tell. From the nephew’s experience we can see that running away from a situation doesn’t help; on the contrary, the problem is likely to get worse. The second way is to try to alter the circumstances. For example, you are at home and you are feeling very restless. You are convinced that there’s something wrong with your home and that this is the reason why you’re feeling so unsatisfied. You consider moving to a different house in a different area, or you think of demolishing your house and building a new one. Perhaps you also decide to buy a new TV and a few other amenities, believing that this will solve your problem. Your also think of installing an air-conditioner. But none of this is going to solve your problems. There are a lot of people who are unable to sleep even though they have air-conditioned bedrooms. They have to take sleeping pills to get even a wink of sleep. What we really need to do is to “air-condition” the mind, because all our problems exist in the mind. Spirituality is the discipline of “air-conditioning” the mind. The problems of life are not solved by changing the outer circumstances. 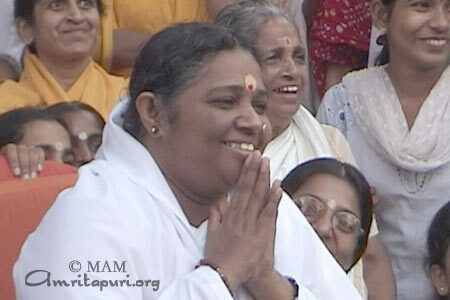 Amma doesn’t mean that you shouldn’t try to change a situation when necessary. But you should try to change your mental situation — your mental state. A husband and wife were always quarrelling. Finally they decided they couldn’t live together any longer, and they were divorced. Soon thereafter both of them remarried. However, it didn’t take long for them to realise that their new marriage partner was the same old person in a slightly different form. This happened because their minds hadn’t changed. It is the mind that needs to be transformed. We cannot free ourselves from our problems by merely changing the outer situation. The third way is to curse our situation. There was a youth who had a stomach-ache. He kept telling everyone about his suffering. “Mom, Dad, I have a terrible stomach ache. Brother, sister, see, I have a pain in my stomach! I can’t bear it!” Finally, everyone around him also got a stomach-ache. In this way people transmit their problems to all those around them. But it doesn’t help them to solve their problems in any way. There is a fourth way to face the situations in life, and that is to change one’s mental attitude. This is the only way to really enjoy life. It isn’t always possible to change the circumstances according to our needs. What is required is that we learn to condition our mind according to the demands of any given situation. This positive attitude is developed by practising spirituality in our lives. What did Lord Krishna teach Arjuna? The Lord didn’t change the circumstances surrounding Arjuna. Instead he taught Arjuna to change his own frame of mind. The Lord could have destroyed the Kauravas by means of a storm or in some other way. He could have defeated the Kauravas by himself, and could have given everything back to the Pandavas. He had the power to do this. But He didn’t change the outer situation. Instead he changed Arjuna’s attitude towards the world. He taught him the nature of life and how to confront it. Even in our prayers we all have those attitudes. King Janaka, Sita’s father, had arranged a contest for all the kings who wished to win Sita’s hand in marriage. 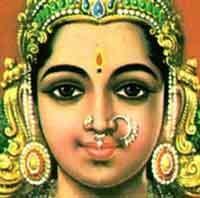 The one who could string the mighty bow of Lord Shiva, which was kept in the palace, would be allowed to marry her. Lord Rama was walking towards the dais to try his turn at stringing Shiva’s bow. When the citizens of Mithila beheld his exquisite form, they prayed, “See how strong and beautiful he is! God, give him the strength to string the bow.” But when the kings who were taking part in the contest saw Rama, they all resented him being there, and they prayed, “O God, why did you let him come here? With him here, I don’t have a chance in this contest.” In this way they were cursing the situation. At that moment, Sita saw Rama and was captivated by his beauty. She prayed, “O God, why did you make that bow so heavy? Please reduce its weight!” Thus she was praying for God to change the circumstances. Among these different prayers, only the citizens of Mithila had the right attitude and prayed in the right way. They didn’t pray for the situation to change, but only that Sri Rama would have the strength to confront the situation, as it was, and that he would emerge successful. Similarly, we should pray to be given the mental strength to boldly face the situation. The best way to pray, however, is to pray for the peace and well-being of the whole world. It is this type of mind that we should cultivate. Our prayers shouldn’t be childish. For example, a little boy goes to a temple and prays, “O God, please make China the capital of America!” A person standing nearby happens to overhear the child’s prayer and asks him, “My boy, why are you saying such a strange thing?” The boy replies, “Well, you see, in the exam I wrote yesterday, I wrote that China is the capital of America. I realise, now, that I made a mistake. So I’m praying like this because if God makes China the capital of America, my answer will be right!” This is mere childishness. Such childishness shows a lack of discrimination, and is a sign of immaturity. Instead of childishness, we should develop the innocent heart of a child, which is something quite different. If a swimming teacher always stays close to his student, trying to hold him up without allowing him to swim on his own, the student will take a very long time to learn how to swim. The student should be allowed to strive by himself and acquire the necessary skills. Similarly, we have to acquire the strength we need to overcome the situations in life. Only by having the proper mental attitude is this possible. We shouldn’t waste our lives resenting the situations we find ourselves in or feeling despondent because we fail to change them. By choosing to have the proper attitude, we will be able to face every situation with a smiling face. Instead of depending on others, we should cultivate faith in ourselves. This is the way to find peace. So instead of cursing the situation, we should try to change our mental attitude. Let us pray for this. Salutations to all of you, the embodiments of the Self, the embodiments of love. As my children have gathered here today, let us first of all chant the mantra “Lokah Samastah Sukhino Bhavantu.” Every one should join in this. “Lokah Samastah Sukhino Bhavantu” — this is the mantra given to us by our ancestors, the great rishis. This prayer is not for us alone, nor for our families, but for the entire world. When you chant this, ask yourselves whether you have such an expansive mind which can imbibe the spirit of this mantra. Children, this is the type of attitude that we have today. We have to change this attitude. We have to make an effort, so that we yearn for the good of everyone. The mantra we chanted just now is not meant for mere verbal repetition, but has to be translated in our lives. Then alone the sankalpa (resolve) of our ancestors will be fulfilled then alone our own prayers will have effect. Children, forget everything else and immerse yourself in meditation. You are said to have the right remembrance when you have forgotten everything unnecessary for the moment. What is the benefit of sitting here and thinking about your kith and kin at home? It will be mere waste of time. If you try to row a boat that is tied to a post, you will never reach the other shore. Give up the notions of “I and “mine” and surrender everything unto Him. He is everything. Realizing that it is His will that prevails, not ours, live in the present moment. An operation will not be successful if the doctor is thinking about his wife and children while performing the operation. In the same way, if the doctor is thinking about his patients when his child comes to him for affection, he will not be a good father. He would be a failure both as a doctor and as a parent. Just as a doctor forgets about his home while he is in the hospital and forgets about the hospital while he is at home, children, forget everything else and be absorbed in meditation. When the children heard this, their attitude changed immediately. There are no words to tell the love they showed towards their father. Each one began to plead with him to come and stay with him. Thus the father once again began living happily with his children. Finally the father died. Wasting no time his sons opened the box. Lo! There were only a few stones inside it. Children this is the nature of worldly love. If we lead our lives looking for it, we will have time only to grieve. When we come to this world we do not bring anything along with us. So also, we do not carry anything when we depart from here. Understanding this practical truth, engage in meditation and japa. Japa and meditation will benefit us right from the moment we begin to do it. It is like fixed deposit, which earns interest from the very beginning. However, do not imagine that sitting with eyes closed alone is meditation. A smiling face, a loving word, a compassionate look, are all part of meditation. Meditation should enable us to fill our hearts with compassion. Then alone God can shine in our hearts. We should understand the sorrow and suffering of others and share them. That is the attitude that we should have. It is this ability to feel for others and share their sorrows that we should cultivate. However, it doesn’t require that we should suffer the same sorrows as they, in order to have this empathy. We will still be able to feel for others. Therefore children, learn to look upon the sorrows of others as your own sorrow and learn to make the joys of others your own joy. It may appear difficult, but we indeed have to make an effort. It is said that in our country there are about one-thousand million people. Only one fourth of the population have adequate means of livelihood. A majority are poor farmers and the rest are even poorer. In reality there is no need for our country to remain poor. If we make an effort, we can easily make a change. Take the example of our own ashram. We didn’t ever ask for money from anyone nor collected funds from anywhere. Everything is the fruit of our hard work. Devotees like you and ashram residents here have worked up to twenty two hours a day without desiring any benefits or remuneration. Many children cut short their expenses to save money for service activities, some even started taking food only two times a day instead of three. With the money thus saved, they offered for service to the needy. The householder devotees contributed their mite to the best of their ability. Some reduced the number of pairs of clothes they used to have. Many who were addicted to smoking gave it up. It is because of such sacrifices that we are today able to do this much service for the people. If a lot more people come forward to make sacrifices for the country, we will indeed be able to bring a change. You may ask whether removing a drop of water from the ocean will make any change to the ocean. Certainly it will, for the water is then less by one drop. Each one of us can make a similar change for the society. If everyone thinks in the same manner, we can indeed make a considerable change for the better. This is the type of attitude my children should cultivate. If the people imbibe the spirit of the mantra “Tyagenaike Amritatvamanusuhu,” they will be able to benefit the society in many ways. Children, it is your hard work which is the basis of all our achievements. All my wealth is my children. Amma doesn’t have anything of her own. All that you see here has come out of your tyaga (sacrifice). My children should always remain vigilant. If there is even a speck of selfishness in you, you should remove it immediately. Otherwise it will soon destroy all our peace. One spark of fire is enough to reduce a whole forest to ashes. Similar is the power of selfishness. Even a little of selfishness will soon lead to our ruin. Understand the true source of happiness and gain strength from this knowledge. Those who rely on external things are weaklings. It is not a sign of courage. The courageous is the one who has gained control over his mind. Children, those among you who drink, Amma would tell you that what you drink is not liquor, but the blood and tears of your loved ones. When a fish bites the bait, it thinks that it is having a delicious treat. It knows not that it is on the verge of death. A dog bites a piece of bone and relishes the blood coming from it. It doesn’t realize that the blood is oozing from its own pricked gums. Similarly, we seek happiness in external things; we do not realize that the real source of happiness is within. Those who care only about their own pleasures should try to care for their families and give up their bad habits. Those who smoke five cigarettes a day can reduce it to two. Those who drink also can gradually reduce the quantity. Thus we can gradually get rid of our self-destructive habits. Keep away from circumstances which induce you to smoke or drink. Understand the true source of happiness and gain strength from this knowledge. Those who rely on external things are weaklings. It is not a sign of courage. The courageous is the one who has gained control over his mind. Reject a life, which is dependent on anything external. We should be able to abide in ourselves. We should be able to convert even our breath into a blessing for the world. Such a pledge you should take from today. That is what Amma expects of you.